Mother’s Day is around the corner and you may be thinking of what to gift your amazing mother. Giving Mom the gift of a pampering massage is a great idea. Mom’s can all benefit from massage. For a Mom that is pregnant, massage can help with pain and energy. For a working Mom, she will receive pain relief, stress relief and help with aching muscles. For a Mom that has small children, carrying babies can put pressure on your back, shoulders, arms, and hips. Relieving this tension and helping to reduce inflammations in these areas can reduce and prevent pain and injury. For a Mom that enjoys working out, post exercise massage can provide much needed repair to different muscles and help with recovery and energy. Here are some of the many benefits of therapeutic massage. Great way to de-stress, renew and rejuvenate. Can help with chronic pain of the back and neck. Reduces symptoms for pregnant women. Helps with energy and fatigue. Benefits those with asthma or allergies. Restores muscles that are tired and overworked. Help with stress and anxiety. Improves circulation and decreases swelling. Massage can be a wonderful way to relax and enjoy some me-time, but it is way more than just an hour alone. There are many benefits emotionally, physically and mentally to getting a massage. 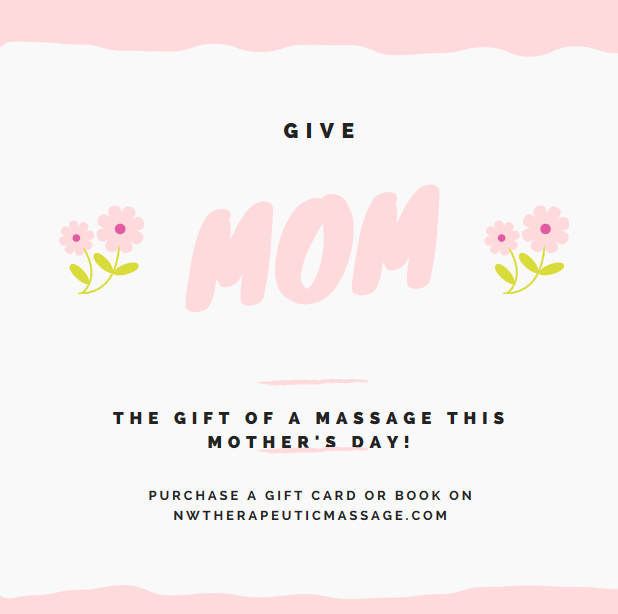 Help your Mom feel her best with the gift of massage! We offer gift cards or you can book her a service.